Feng shui front door tips can help you correct problem areas and improve the flow of chi into your home. From front door colors to what you place around it, such as doormats or water features, adding feng shui principles to your front door invites positive chi energy. Before you start working on the front door of your home, examine and evaluate the exterior of your home. The exterior of the home, especially the area surrounding your home is more important than anything inside your home. Now that you've evaluated the exterior of your home, you're ready to begin correcting and finding remedies for any problem areas leading to your front door. The grounds surrounding your home and leading to your front door impact the flow of chi energy into your home. If you have land formations or obstacles blocking the front entrance of your home, they block the chi or only a portion of the energy can enter your home. It's important that you clear the paths to your front door. Test out the pathways and walkways to your front door. Imagine the chi energy as though it were water flowing in a stream toward your front door. Difficult footing or uneven terrain will slow down the chi energy and in severe cases, completely prevent the chi from entering your home. Debris is clutter. It easily becomes a safety hazard, especially wet leaves that can cause people to lose their footing. Another consideration is that debris on your sidewalk will be tracked into your home. The first thing to do is clear all walkways, pathways, and sidewalks and keep these areas clear of debris on a regular basis. It's always preferable for the pathway to your home to be a meandering winding trek to help slow down the flow of chi so your home won't be bombarded with forceful and fast flowing chi. Your walkway should also be landscaped, so your guests and chi energy have a welcomed approach to your home. 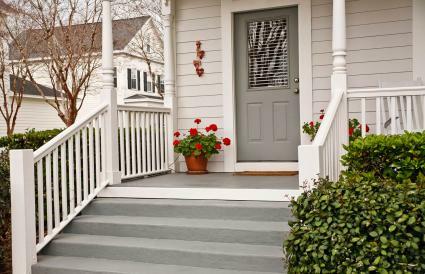 If you have a porch, patio or deck at your front door entrance, keep it swept clean of debris. Leaves, weeds and other types of over-grown, plant life stops the flow of healthy energy. Make sure any painted areas are in good shape. Peeling paint or faded stain needs refurbishing. The best thing you can do is to take some time to assess your front door and the front door entrance inside and outside your home. The elements of nature such as sun, wind, and rain can damage your front door. Repaint scuffed, faded or peeling paint. A brass or copper kick plate is a good way to add a metal element when one is needed for a feng shui remedy. Black Hat Sect followers believe that painting the front door red is an auspicious thing to do. They believe that the color alone activates an element and attracts positive energy. If you follow this kind of philosophy, then you certainly can. If you practice classical feng shui, you can easily paint your door any color since traditional feng shui doesn't typically recognize that a color can activate an element. Classical feng shui teaches that only an element can activate a sector element. If you wish to assign color with direction, then you'd want to be certain that your front door faces South or falls within the South and Southeast sector of your home. Properly light your front door to invite chi energy into your home. Replace burned out light bulbs. Repair your outside lights if they don't work. For security, place a pair of foo dogs (also spelled fu) on either side of the entrance. These don't need to be monstrous like ones in a Chinese palace. Tiny ones discreetly placed among your shrubbery, in a container or other areas is sufficient. The foo dogs are a Chinese symbol of security. Let these lion dogs stand guard outside your home. House numbers should be easily seen and in good repair. Regardless of the size or structure of your home, you want to make it inviting and the entrance needs to be highlighted. Don't use prickly plants like holly or spiky plants like a miniature cedar; they create poison arrows. Place a planter on either side of your door with a money plant or some form of plants with rounded smooth leaves. Geraniums are very auspicious front door plants for their leaf shape and blooms. Try red geraniums placed on either side of a south-facing front door to boost your fame and recognition. Succulents are a good choice when you select varieties that have round leaves. A jade plant is one of the best auspicious succulents since its leaves are round and symbolize coins. A potted chrysanthemum is very auspicious for the front door since its blossoms are round. Place in a large pot to symbolize abundance and prosperity. Choose a color that matches the front door compass direction. Make sure your doorbell is in good working order. If your door squeaks on its hinges when it's opened and closed, break out some lubricant spray and get rid of the squeaks. Fix any broken locks, doorknobs, handles, window panes, molding, weather stripping and any other parts of your door and surrounding area. The inside of your front door entrance is just as important as the outside appearance. Make this area inviting. Keep it free of debris and obstacles. Paint if necessary. Add good lighting with table lamps or floor lamps. Treat the front door as though it were the entrance to your business whether you have one or not. Look at your entrance the same way you would upon entering a business. How do you feel when approaching your front door? Is it well lit, unobstructed? You can apply these easy feng shui tips without much effort or expense. Your front door design will be ready to receive and attract positive chi energy to benefit your life.